Ramanavami is celebrated as the birthday of Lord Rama on the ninth day (navami) after the new moon day in the Hindu month of Chaitra (25th March 2018). The ideal life of Rama, who was an avatar of Lord Vishnu, is the reason to celebrate Ramanavami. 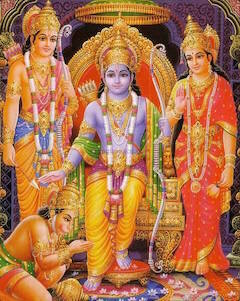 The story of Rama’s life as described in the epic Ramayana defines the concept of dharma in the form of the ideal husband, wife, brother and parents. The Ramayana also describes the ideal of service and dedication in the form of Hanuman. Ramanavami is a day which celebrates Lord Rama and all of the ideals associated with him in hinduism. When Rama’s brother Lakshmana lay injured in the battlefield (in the battle with Ravana), Rama said, “I may find a mother like Kaushalya or a wife like Sita but I can never find a brother like you”. When one of Rama’s brother Bharat found out that Rama had been exiled from the kingdom and into the forest, he went to the forest to try and convince Rama to return and reclaim his rightful role as King. However, Rama had already promised his father Dasaratha that he would stay in the forest for fourteen years. Bharat was so disconsolate that he returned from the forest with Rama’s slippers and installed them on the throne. There are many other stories in the Ramayana which describe the ideals of brotherhood in similar ways. The day of Ramanavami should be used as an occasion to resolve to emulate such ideals in our lives. The Ramayana transcends all barriers of time, space, caste and religious sects. According to Sai Baba, the Ramayana is said to teach the pravritti and nivritti aspects of life. Nivritti is the embodied form of the atman whereas pravritti is the embodied form of prakriti (nature). Nivritti broadens our outlook whereas pravritti does the opposite. The Ramayana teaches us to perform actions focused on nivritti i.e. those actions which raise our spirits and bring out atman closer to the supreme God. Let us resolve to install the principle of Rama in our hearts and experience bliss on the auspicious day of Ramanavami! The repetition of the name of Shri Rama is the simplest form of invoking Lord Rama. The simple chant is both powerful and uplifting. Repeat and enjoy! Another popular stotra is the “kripaalu bhajman” stotra which sings the praises of Lord Rama and his many divine qualities. 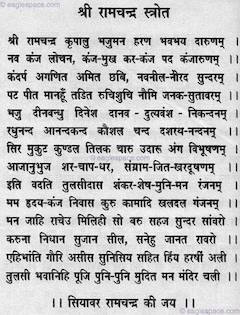 A portion of the stotra is given below in English and the full text is also provided in Hindi. 9 Responses to Why Celebrate Ramanavami? Nice blog. Rama navami when celebrated with music, dance & discourses take us more close to Lord Rama. This is just a information for everyone to know…. The verses in Tulsidas RamCharitmanas have powers of mantras and many of these can be used to cure diseases or get relief from problems.Similarly The stotras of Hanuman ji are very powerful and help in removing difficult problems easily, especially the adverse effects of Shani Sade-Sati . thanks a lot for taking me to my childhood where i was used to chant RAM nam. Rama name is very popular,very powerful and also sounds good.If any guy is unlucky then he should chant it number of times.Also if ‘Rama’ this name is kept to any small baby at its naming ceremony then when it grows up it will be quite lucky. There is a lot to learn from Ramayana. ‘Maryada Purushottam’, ‘ek vachani’, ‘ek baani’, ‘ek patni’ after all he sacrificed his valuable young years, and overall the most touching thing is ‘pitruvaakya paripaalanaa’, which is needed and learnt by the youngsters, otherwise they will lose the ancestral knowledge and they have to go to others for seeking knowledge/solutions at the critical conditions of life. Think of Nisarga and the human beings and the relation in between. ‘Annadavikrutiyenisuvee deha, unnise bhaava vikaara samooha’. This body has become from the food and when we feed the thousands of ‘vikaara’ start in the mind. When we control these ‘vikaara’, we can lead a good life. This body has just become of these ‘panch mahabhootas’ and we should be thankful for the Nature, which nourishes in all the way of life and teaches new lessons and gives chance to repair our lives well, still we do the mistakes then we ruin our lives. Your presentation on the topic "Ideals of Ramayana" is very timely for the whole human kind because as you say the epic of Ramayana has many lessons to emulate for any human relationship. We can all enrich our life and family life with various lessons that Tulsidas has so rightly described in his great poem. I love every bit of it and try to emulate whatever I can to let my family follow the Truth,Beauty and Goodness of human existence. Like Vivekananda says – If you don't have "ideals" or role-models to strive towards, how are you going to progress and become better? I think that is why the Ramayana is so popular among common folk – because of its simplicity and the ideals that it promotes.